After a long day spent killing time in Arequipa, we boarded our overnight bus for the ten hour drive to Nazca. Buses in Peru are an experience all of their own – starting with an airport style checking of luggage and search of you hand luggage, followed by the slightly morbid practice of taking your photo when you are seated, so that they can identify the bodies in the event of a crash. With the pleasantries out the way, we set off for Nazca, arriving just after 8am – thankfully, our CEO Kantu had organised an early checkin so we were able to get straight into our rooms and get some rest. For cost, one of us decided to do the Nazca lines and Jamie jumped at the chance. 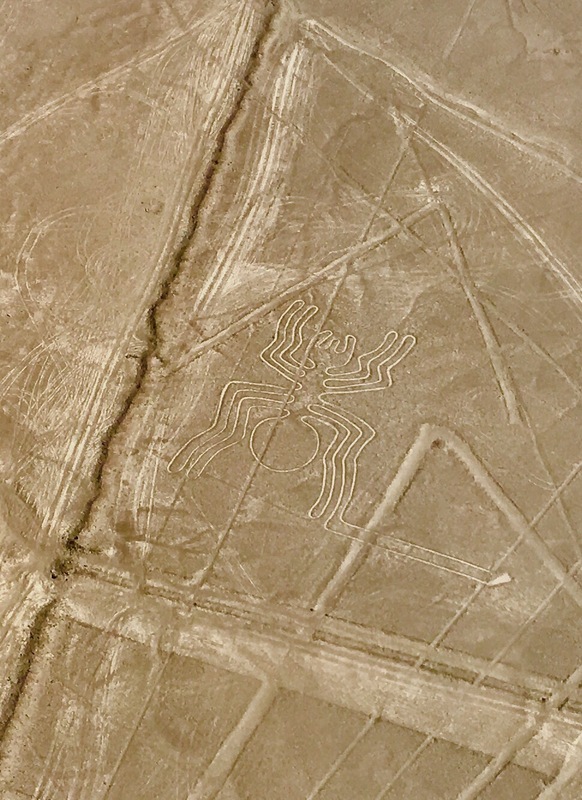 The Nazca lines are ancient patterns on the ground made by a pre Inca society for unknown reasons. How they drew them and what they knew they were drawing (as they couldn’t see them from the air), is a mystery. Especially, as they range in size from 40 to hundreds of metres. Arriving at the airport Jamie found his check in desk and was weighed for his flight. He only had to wait for 20 minutes and went through security, met his pilot and walked out onto the runway. A myriad of small six seater planes were all lined up and the pilot led the way. Most of the group had never been on such a small craft and Jamie hadn’t until Vanuatu. The plane took off for a 40 minute round trip to view the lines. First up was the whale. The pilot banked steeply and turned in tight circles so both sides of the plane got a clear view. This made everyone’s stomachs do a flip and they all spent the next 30 minutes trying not to vomit. Up next was the triangles and the astronaut (or alien) who is sketched into the side of a mountain. Probably the least impressive of all the lines. One of the main famous ones came a little after, the monkey. It was quite hard to see and even more difficult to photograph but his spiral tail was clear. Close by was the dog and then it was on to the hummingbird who sat on top of a dark plateau, which made it very clear. Next up was the spider, also quite clear and the very faint condor. The plane then crossed the desert to the flamingo (which looks like the hummingbird but with an enormous long neck) and the pelican who was surrounded by other unidentifiable lines. The parrot was close by to here: but looked nothing like a parrot. Finally, the plane circled the observation tower next to the hands, tree and lizard (which the government unfortunately built a rod through). The plane then flew back to the airport and once off everyone got some sugary drinks to settle their stomachs. While half the group were completing the Nazca flights, the rest were clearing out the beer aisle at the local supermarket. 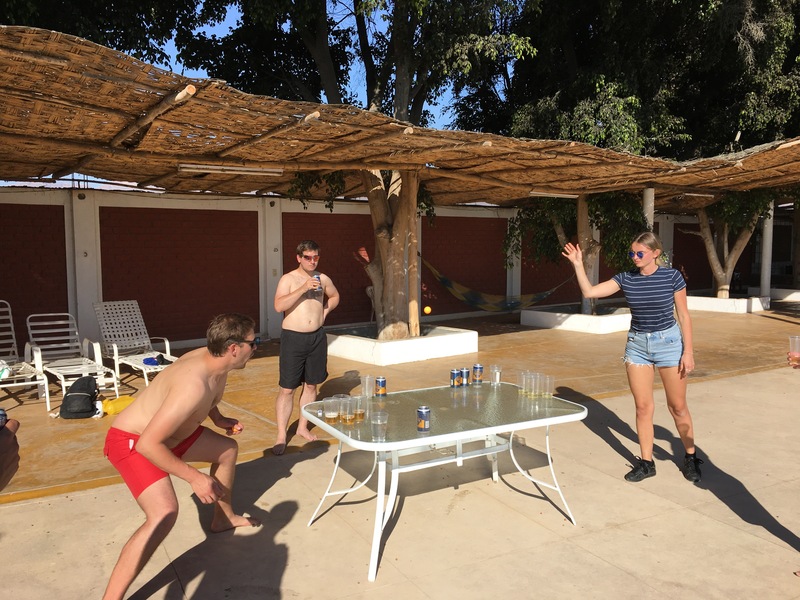 The find of the day was a ping pong set – the result a day of beer pong by the pool. Clearly James had far too much experience, and was reigning champion for much of the day – although while otherwise aim improved the more they drank, his faded. As the sun went down, it was time for a short break from the drinking to shower and change for dinner. Dinner was a feast of meats and vegetables, prepared in a traditional method using a large hole in the ground with hot stones, wrapping the food in canvas and then burying it for an hour to slow cook. It’s not often you get to dig up your dinner but it was surprisingly tasty. Straight after dinner it was back to the pool area for some epic card games – where James was made to atone for his beer pong prowess by having to drink several dirty pints. The evening ended when the alcohol ran out and when the reality of tomorrow nine hour bus trip sunk in. Thankfully, the next day would be broken up into several stages. We awoke feeling less hungover than expected and boarded the bus. 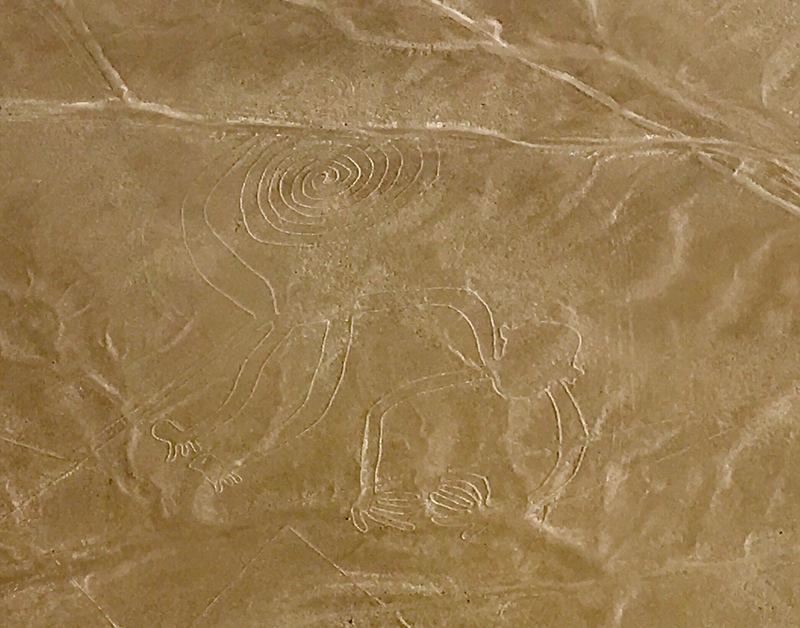 As we headed out of town, we stopped at a viewing platform for the Nazca Lines that gave a reasonable view of the ‘Hands’, ‘Tree’ and ‘Lizard’. I sent the drone up to search out the other figures but a combination of low flying tourist planes, thousands of lines in the sand and time meant we weren’t able to search out any of the more impressive figures. Nazca lines complete it was onwards to our final stops of our Buenos Aires to Lima adventure.